Tickets from Lippupiste 40 € + possible delivery fee. Duration 2 hours with intermission. Tickets from Lippupiste: 20 € / 15 € / 10 € + possible delivery fee. The robust sound of folk music meets the urban swing of jazz as Värttinä and UMO Jazz Orchestra continue their co-operation. The percussionist of Värttinä, the conductor of UMO Mikko Hassinen has done arrangements of the most popular songs of the world-renown folk group. In addition to “Seelinnikoi” and “Äijö”, the orchestra plays arrangements of some more recent songs of the folk group. 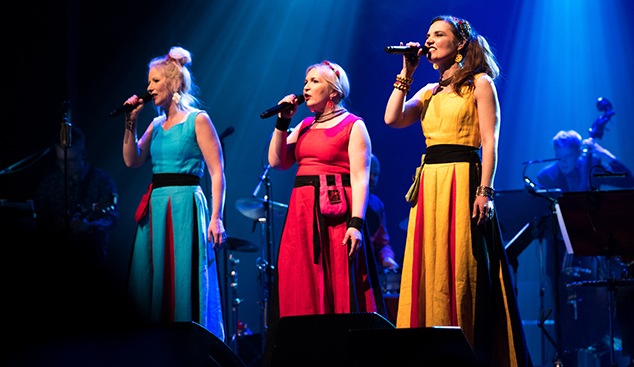 Värttinä is the most successful group of modern Finnish folk music. The music of the band has strong links to Karelia and especially to the singing tradition of women and poetry. The group consists of three female singers and three masterful players of acoustic instruments. The band composes and writes the lyrics of the most of its songs. The arrangements share the easily recognizable characteristics of all music of Värttinä. The concert presents a rare extravaganza of music, as the indisputable forerunners of their field of music – UMO and Värttinä – join forces.